Announcement Personalized leather water bottle holders are now available. Check out the examples in the shop and change the words to your name, initials, or your choice of words. You can also customize your order by choosing from 14 colors or adding an adjustable crossbody strap. Just convo us. Don't see a mini bag or phone case in the color you're looking for? Convo us. We offer 14 different colors. Personalized leather water bottle holders are now available. Check out the examples in the shop and change the words to your name, initials, or your choice of words. You can also customize your order by choosing from 14 colors or adding an adjustable crossbody strap. Just convo us. Thank you so much! The watch and service are both top notch! Monarda (aka Bee Balm) outside the workshop. Finally got the show booth nailed down, New banner. Life is short, so we grew MonardaZ! I've always been interested in the creative process, and have worked in many media, including wood, paper, and metal - more recently, leather. But I've always relied on the outside workaday world for living expenses. At a certain point, my wife and I agreed that since life is so short, we should spend our days doing what we love. MonardaZ was the happy result of that decision. We offer leather accessories, completely hand made and hand dyed, many featuring our own interpretation of the Steampunk style. On our website, MonardaZ. com, you can also Build Your Own with our easy to use format, and pay for the custom listing on Etsy. Our offerings now include wooden objects and one of a kind Steampunk table lamps. A few years ago we built our workshop so that we could move everything out of the basement and control some of the clutter and dust. At that point I was still working "outside". I needed the calm tranquility that the workshop provided, so we named it the Harbor. The Harbor is a stand alone structure with lots of storage. It's outfitted with all the tools, hardware, and power equipment I need (but no power tools or machines are used to make our leather pieces). There's a loft, which I use for storage, and a nice transom window over large doors. It is the perfect area for woodworking, painting, repairs, upholstery, etc. 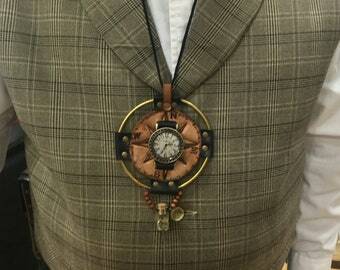 Of course, I "steampunked" it up! When I started to get interested in leather, I created more workspace back in the basement to house all my leather tools, a workbench, and storage for all of the items used in creating leather accessories. I feel lucky to have two spaces for my work, and I'm very happy to be able to share what I make with you at MonardaZ. Thank you for stopping by. If you're looking for Mark and he's not in his workshop, check the leather chair in the living room. But don't be surprised if he doesn't look up right away. He'll be drawing in one of the many of leather-covered journals that he's filled over the years. Mark has the kind of mind that's continually seeing possibilities for home furnishings, room design, accessories, gift containers, jewelry, carved objects, and more. Much of what he draws eventually comes to life. You can also build your own phone case, mini bag, or key chain! We've made it easy. To set up a custom listing on MonardaZ at Etsy, please go to MonardaZ.com. Take a look at the phone cases and mini bags we offer. Choose a style, color, size, strap and other features just by clicking on Build Your Own. We'll take care of making the MonardaZ at Etsy listing for your order and you can buy from MonardaZ at Etsy as usual Your accessories can and should reflect who you are. Please check back with MonardaZ from time to time to see what has leapt from the pages of those journals. Refunds and exchanges: We are confident that our items will meet your expectations, and we strive to ensure your satisfaction. However, if you are not completely satisfied, please contact us right away. You may return your order* within 7 business days from the date you received it. A refund minus the shipping cost will be issued in the same method as the original payment as long as the item was returned in original, unused condition. Buyer is responsible for return shipping. * Please note that custom, personalized, or Build Your Own orders and any item that has been altered are final sales and are not eligible for refunds or exchanges. Payment: MonardaZ accepts Etsy Payment. This allows you to use credit or debit cards, or Etsy gift cards. Massachusetts residents will be subject to 6.25% state sales tax at checkout. Shipping: Many items are made to order. The time it takes each item to be ready to ship is listed for each item. We will contact you if there are any unexpected delays. We ship USPS Priority Mail with tracking numbers. Health and safety: MonardaZ uses only veg-tanned leather in our mini bags, watch bands, phone cases, key chains, and water bottle holders. Organic materials such as bark are used in the tanning process instead of chemicals. Our dyes and colors in the above products are water-based and do not contain solvents. Note about colors: Due to the variations among computer monitors, the colors you see on your screen may vary slightly from the actual colors on our products. Intellectual property rights: All images, artwork, and reproductions on MonardaZ.com are copyrighted © by Mark A. Tetreault. All rights reserved.